People live in places. That’s why the Rural Family Economic Success (RuFES) framework uses a place-focused approach to helping families Earn it, Keep it, and Grow it. 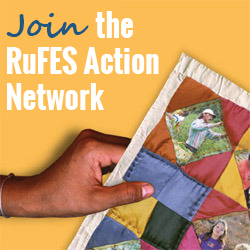 RuFES starts by learning about the hardworking families in a rural community who are struggling to get ahead. RuFES then examines the barriers that stymie these families’ progress and finds out what it will take to remove the barriers. Often, this means identifying ways the community can change or adapt to help hardworking rural families enter the economic mainstream. The Citizens’ Institute on Rural Design (CIRD)* is a national initiative that, like RUFES, uses a placed-based approach to improving the lives of rural families. CIRD (formerly known as “Your Town”) embraces community design as a powerful tool that rural places can use to leverage existing assets and improve a community’s quality of life and economic viability. CIRD works to help rural communities with populations of 50,000 or fewer enhance their quality of life and economic vitality through facilitated design workshops. The program brings community stakeholders together with planning and design specialists to develop creative strategies that address complex design challenges like strengthening economies, enhancing rural character, leveraging cultural assets, and designing efficient housing and transportation systems. On January 10, 2013, CIRD issued a Request for Proposals to rural communities interested in hosting local workshops to address these challenges. Communities selected to participate in the Institute will receive $7,000 to support planning and hosting a two-day community workshop, plus in-kind design expertise and technical assistance valued at $35,000. The deadline for submitting a proposal is Tuesday, March 5, 2013 at 5:00pm EST. Find the RFP and application guidelines at www.rural-design.org/apply. Selected communities will be announced in May and workshops will be held during the summer and fall of 2013. Click here to learn more about past grantees. January 23, 3:30-4:30pm EST – This General Information Call will provide a brief intro to CIRD and the 2013 Request for Proposals from program partners. February 7, 3:00-4:30pm EST – This Community-Centered Project Design Call will help you think through critical steps in shaping a successful CIRD application or any community-centered design project. February 28, 3:30-4:30pm EST – During this time, CIRD staff will be available to answer questions about the RFP and application process. *CIRD is a National Endowment for the Arts leadership initiative in partnership with the US Department of Agriculture and Project for Public Spaces, Inc., along with the Orton Family Foundation and the CommunityMatters Partnership. To learn more, visit CIRD’s new website here. Photo of children jumping taken by The Kilens and shared with a Creative Commons License.